Death Trooper (Rogue 1) Feast Your Eyes! Having the diagonal lines on the armor kind of reminds me of C3PO and if these Death Troopers are part of Vader's group, I wonder if there is a purposeful connection to that. Hmmmm... Kevin W.
So who would be interested in a Glossy BLACK ABS Legacy FemTK Armor & Helmet kit??? It just so happens that I have a pallet of this beautiful Glossy Black ABS that I special ordered coming in less than 2 weeks. If your interested let me know.... As soon as the plastic arrives, I will make a kit and take pictures to share it here. Thanks Kevin W.
Imperialboots custom made the kids TFA gloves for my boys and the boots. The boots were size 34 & 35. But he used TK style soles with FO uppers. My boys are kind of tall for there age. He used his 8 year old son's hands as reference. I gave him the measurements of my kids hands from wrist to middle finger tip and palm circumference. Kevin W.
I just want to lay this out on the table... I am not manufacturing this or anything for Anovos anymore. I've had nothing to do with this. Kevin W.
The (smooth looking) inner forearms part has what I call the "Connection Flange" That step is so you can glue the parts together and it will help create a seamless look. The forearm on the right with the (step ladder detail) will need to be cut just above the section that steps out. After the two halves are glues together you will need to add some bondo to smooth out the seams. Kevin W.
Your lower legs will sit a little higher when you have your boots on. My Wife is 5'11" and she wears this set of armor. Kevin W.
Congrats on approval. It looks great!!! Kevin W.
The Helmet looks nice. It takes time but it looks like you are doing a great job. Kevin W.
I am so sorry this thread had to end up here. 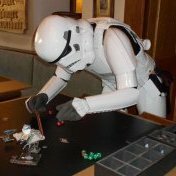 In a place that has become so non friendly to other members of the 501st, no mater what costume they are trying to assemble. Terry is a 501st member and he was just asking for help, experience and guidance. But just because you do not UNDERSTAND the costume should not give you right to tear down someone for something you know nothing about. My FEM7 is NOT a Stormtrooper costume! I know there is no canon character like this in the Star Wars universe. That's why I was able to make it. I have devoted 10 years of my life sculpting canon characters and have made over 16 different ones for the 501st members and some for the Rebel Legion. I know all the nit picky details that need to go into making a costume so that it can be approved by the 501st. This FEM7 was something I wanted to do, to break away from all rules that tare down the fun and creativity. Simply, I got board as an artist, just coping someone else designs and making it look as close as I could to resemble a canon SW character. Making things function was fun as most of the characters I have made over the years where never a tangible armor. It all came from CGI or drawing or animation. So the FEM7 was just taking the things I have learned and love about Star Wars and making something fun for the ladies. Cosplay is huge!!! It goes way beyond the 501st. You need to think outside of the box and realize there is more to costumes than just the canon characters. Sometimes it's just about expressions, like a person who creates new fashion designed dresses for a run way show. I am creating something new with a material I am familiar with. I am creating a new line of Cosplay armor that women can do what ever they want with it. Paint it any way they want. Add any add-on parts they want. Simply, they can just have fun with it and not worry about what others think. Kevin W.
Scott... You are correct. Glad you noticed that. Hope the changes can be made so that other do not get confused. Kevin W.
NO, NO, NO, their gloves are far from accurate. Imperialboots has the most accurate gloves. They use the correct black thread for the stitching on the palm pads. etc. Kevin W.
I order mine at the end of last year or first part of January, right around the time when they first closed down their site. (I can't remember exactly) but yes this is what the correct TFA under suit looks like. Just a heads up the material is much thicker than what we are used to with normal underarmor. It feels more like cold weather under armor. Mine is still the in the bag. I think it would be too hot to wear it here in sunny Southern California. Kevin W.
Thanks everyone!!! No the helmets they wore are the full helmets i got from Target but I repainted the white to match the armor. I plan on making my own smaller ones to better fit them. Kevin W.
Thank you to many other people who helped with the soft goods... Kevin W.